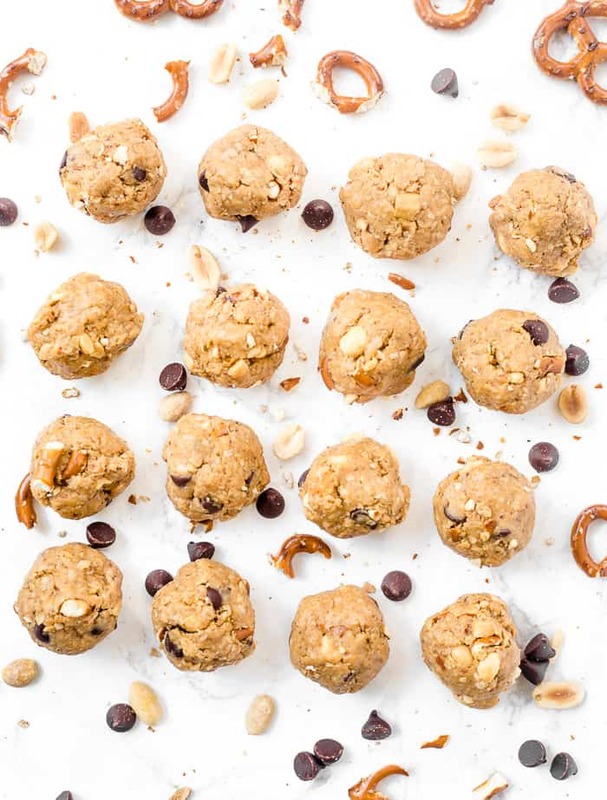 Based on one of my most popular blog recipes, these pretzel peanut butter energy bites are an easy, sweet-and-salty snack with just six ingredients! 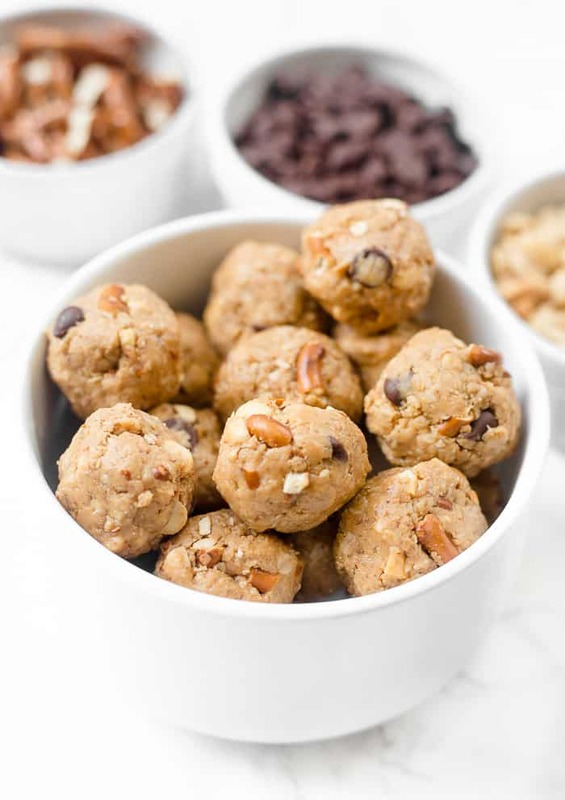 One of the most popular recipes on my blog is these four-ingredient peanut butter energy bites, which I posted wayy back during my freshman year of college after I’d been blogging for about 6 months. Somehow, the recipe started getting thousands of views from Facebook all of a sudden. On the second day of the post going “viral,” my little newborn blog got 15,000 views in one day. I remember telling my roommate all about it because I was so amazed at the giant jump. The Facebook traffic surge mostly died down after a month or two, and it’s been more of a steady uphill climb since then. Since I’m always looking for ways to mix up my tried-and-true recipes, I came up with this pretzel peanut butter energy bites recipe inspired by Ben & Jerry’s Chubby Hubby ice cream. I’ve added chopped peanuts and crushed pretzels for some salty crunch. I also reduced the amount of oats slightly to account for the added pretzels and peanuts. 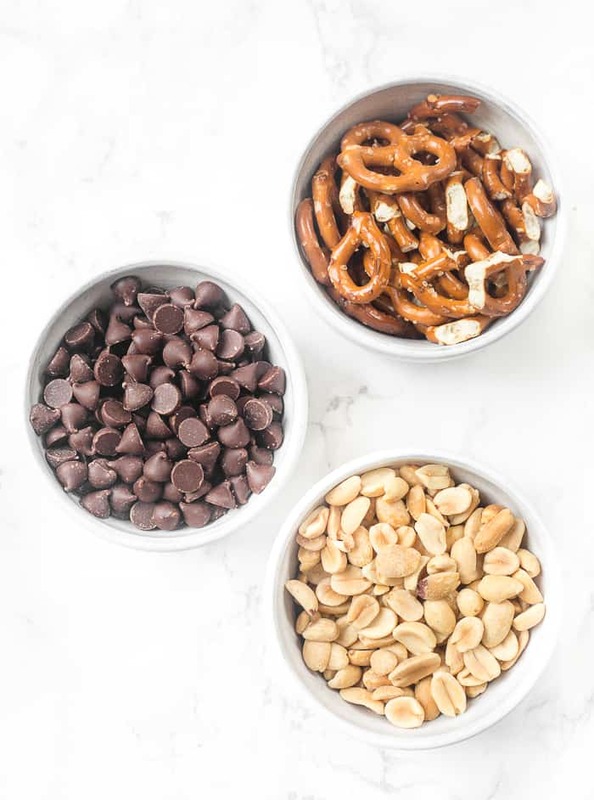 Of course, I’ve kept the chocolate chips because the peanut butter + chocolate combo is part of the magic of these energy bites. 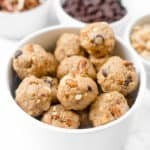 Like the original energy bites, these are really great to make in advance for snacks for the week or to give as gifts to friends! If you try these pretzel peanut butter energy bites, feel free to let me know in a comment or take a picture and tag me @livbane on Instagram. I’d love to see! Measure out peanut butter. If your natural peanut butter is thick from being refrigerated, try popping the measuring cup of peanut butter in the microwave for 15 seconds. Add peanut butter, oats, and honey to mixing bowl and stir for several minutes until well combined. Depending on the consistency of your peanut butter and honey, you may need to add an extra tablespoon of peanut butter or honey to bind mixture together. Add pretzels, peanuts, chocolate chips, and optional wheat bran, hemp seeds, flaxseeds, or chia seeds, and stir again. Roll into approximately 24 tablespoon-size bowls and place into a gallon-size bag. Refrigerate for at least 2 hours or freeze until solid. Store in refrigerator for up to 2 weeks or freeze for up to 3 months. These are so easy and quick to make, why not submit the recipe to a magazine for moms. Wouldn’t it be fun for children to make the balls with their mom’s guidance? The whole family could reap rewards. WOW these sound and look like crunchy delicious cookie dough. I haven’t seen pretzels in energy bites before, and I think that’s an amazing idea Liv. Hoping to try this some day soon! Such a delicious combo. These are perfect!! My kids definitely gonna love these for Sunday snacks. I will try to make a batch soon. Thanks for sharing.